Over at my library blog, Kurious Kitty's Kurio Kabinet, I have a post today about ekphrastic poetry--poetry about art. I came across a poem, though, that may or may not be an ekphrastic poem. 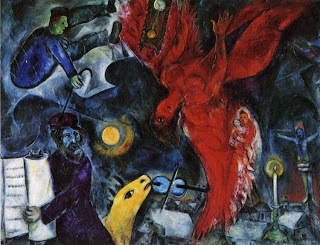 Is the subject a real painting, or a painting that could have been done by Marc Chagall? 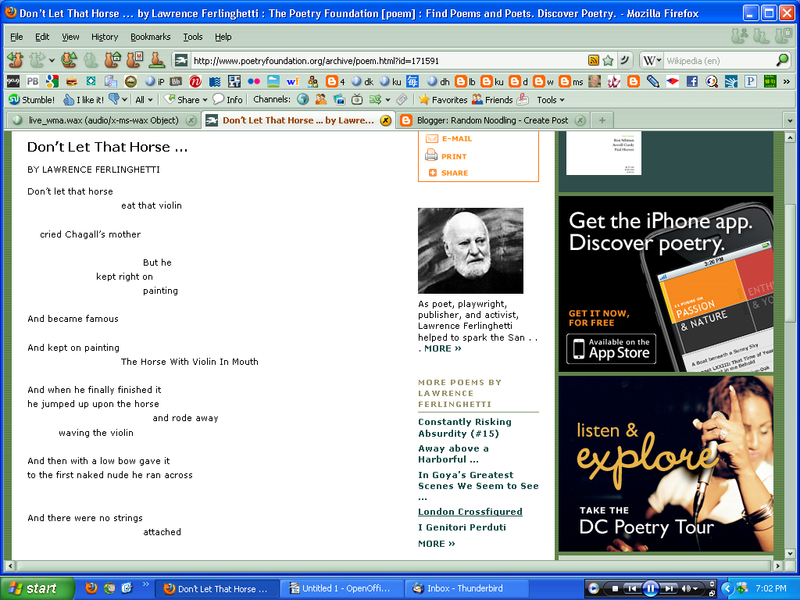 I've got the poem below in a screen shot so that you can see the layout. The text is below that. I did a search on "The Horse With Violin In Mouth" and the only hits I got were those quoting Ferlinghetti's poem. Hmmmm. Chagall had many horses in his paintings. He also had many violins. If anyone knows for sure, let me know if there is a real painting called "The Horse With Violin In Mouth." Here's the closest I came to finding "The Horse With Violin In Mouth," except that this picture is called "The Falling Angel," and I think the horse-like creature with the violin nearly in its mouth might be an ox! Note: not surprisingly, the poem has been set to music. Click here to listen. Head over to The Art of Irreverence for the Poetry Friday Round-Up! The poem, the song, the artwork -- everything spoke to me. I couldn't have enjoyed this more if I tried! I've read this poem before but never imagined it would be set to music. Kinda fun in a weird sort of way! Too cool, Diane! I love ekphrastic poetry! hmmmm. Looks like a horse with a violin in its mouth! Oops, that didn't work since it was read as spacing! Duh! Email me and I'll send it to you! Thanks for sharing this, Gary! "Papish cats"? Interesting... Catholics? Real cats who are Catholic? I can't see the later since cats aren't the types to be reined in by Catholicism. (Cats can't be reined in by anything!) People with funny pope hats? I performed this poem as part of a theatre ensemble that performed during the opening of the Witherspoon Art Gallery at the University of NC at Greensboro decades ago. The Chagall painting is not the one you have here. Hopefully I can find the one that we showed on screen and will send it your way. At A Poem a Day from the George Hail Library, Maria Horvath, found the picture that goes with the poem. You can find it here. Thanks for writing, Bob.